• It is called “polymerase” because the only enzyme used in this reaction is DNA polymerase. 1. 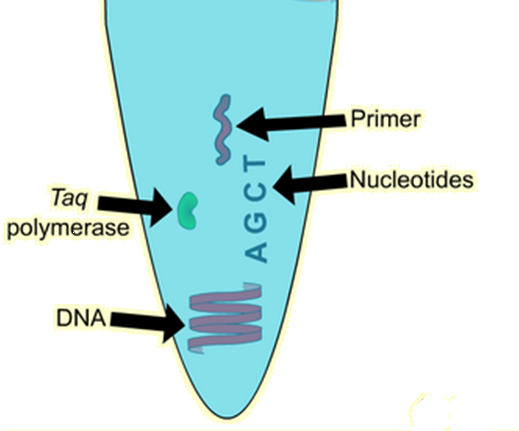 Target DNA - contains the sequence to be amplified. 3. dNTPs – deoxy nucleotide triphosphates: DNA building units. 5. Mg++ ions - cofactor of the polymerase enzyme. 6. Buffer solution – maintains pH and ionic strength of the reaction solution suitable for the activity of the enzyme. A PCR cycle consist of 3 steps: Denaturation, Primer annealing and Elongation. • Reaction mixture heated to 940C for 1 minute. • PCR can be used to sequence DNA directly.